Solexel, one of the few remaining standalone solar silicon startups, has completed a long-in-the-making $70 million round of funding and added Riyadh Valley Company, the VC investment arm of King Saud University of Saudi Arabia, to its list of investors. According to an SEC form, Solexel closed the D round in June. Last year, Solexel added new investor GAF, a large roofing materials manufacturer, to its roster of investors, which includes SunPower, KPCB, Technology Partners, DAG Ventures, Gentry Ventures, Northgate Capital, GSV Capital, Jasper Ridge Partners, and Spirox. The firm's board of directors includes Mehrdad Moslehi and Michael Wingert of Solexel, as well as Ira Ehrenpreis of Technology Partners, Les Vadasz, Jan van Dokkum of KPCB, and Greg Williams of DAG Ventures. SunPower did not reinvest in last year's D round first close. Earlier this year, Solexel picked up $25 million in senior debt financing from Opus Bank. The startup hit an NREL-certified cell efficiency of 21.2 percent in 2014 with its back contact cell and looks to produce PV modules at 20 percent efficiency. As we reported previously, Solexel is seeking to partner in Malaysia to build the modules and cells. The firm has a megawatt-scale pilot line in Milpitas, which it intends to "copy-exact in Malaysia," according to CFO Mark Kerstens. 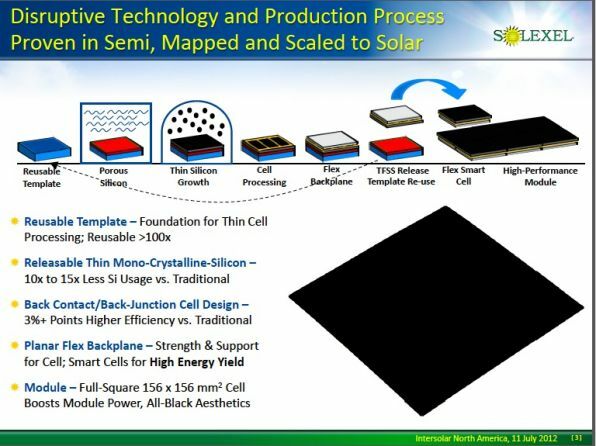 Solexel is hoping to mass-produce 35-micron-thick, high-performance, low-cost monocrystalline solar cells using a lift-off technology based on a reusable template and a porous silicon substrate. According to the company's claims, the process ensures that the thin silicon is supported during handling and processing, while the back-contact n-type cell dispenses with the need for expensive silver, using aluminum instead. The process uses no wet steps, according to CEO Michael Wingert, and employs chemical vapor deposition (CVD) on trichlorosilane gas at atmospheric pressure, with silicon deposited at a rate of 2.5 microns per minute. The cell uses nearly 10 times less silicon than conventional c-Si cells, at about 0.5 grams per watt. Solexel claims that its cells don't need the support of glass, and it envisions using lightweight, non-glass sandwich panels in future product offerings. A resin and fiber carrier, akin to circuit board material, supports the thin cell and allows a diode to be added for module shading tolerance. Board member Ira Ehrenpreis notes, "Solexel’s recent fundraise is one of the most successful capital raises in recent history for private solar cell and module manufacturing companies. Investors understand the extraordinary potential of combining a high-efficiency, lightweight product with fully integrated electronics for shade management along with superior aesthetics for the rooftop segment of the market. Other companies have attempted to build a product with one of these elements, but no company has created a product that combined them all -- until Solexel." He added, "While some still look in the rearview mirror and see the Darwinian process of several failed attempts by other solar companies, today, most instead see the extraordinary growth of the solar market in recent years and an opportunity that’s still in its nascence. Innovative companies that produce differentiated products that can compete on cost, value and aesthetics will be inevitable winners in the industry." According to business information firm naseba, "The Middle East is the most liquid region in the world today and investors based there are keen to adopt innovation, as well as foster entrepreneurship." The D round included a sales commissions cost of $4.6 million paid to naseba, Harbor Light Securities and National Securities Corporation, according to the SEC document. 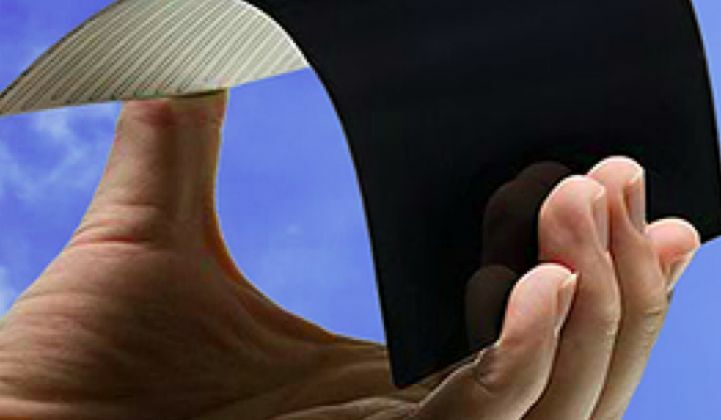 Last week, Shunfeng acquired a majority state in advanced silicon solar cell builder Suniva. SolarCity acquired advanced silicon manufacturer Silevo last year. TetraSun was acquired by First Solar in 2013. Solexel CFO Mark Kerstens suggested that most high-efficiency solar panel production is already spoken for by vertically integrated firms, leaving few high-efficiency PV module choices. Other firms in the thin silicon business include 1366 Technologies, with its "direct wafer" technology using molten silicon directly converted into wafers, and Crystal Solar, which uses a vapor deposition process for making thin crystalline silicon wafers. Last year, Saudi investors acquired Solar Junction, a triple-junction solar cell developer. Last month, GlassPoint, a CSP developer focused on enhanced oil recovery, closed a $600 million deal for the largest solar plant on the planet with Petroleum Development Oman (PDO), the largest producer of oil and gas in Oman. Lightweight, attractive, high-efficiency modules can command a premium in certain residential and commercial markets. Meanwhile, First Solar, the thin-film solar leader, recently announced that its manufacturing lines in Malaysia are producing panels for $0.40 per watt at more than 15 percent efficiency. That cost seems to be in line with many of China's polysilicon module manufacturers. It's taken Solexel close to $250 million to move this differentiated solar technology to the multi-megawatt pilot production line stage. Given the diminished state of cleantech VC, raising that scale of funding is remarkable and required some creativity on the part of the team -- as did solving what must have been immense materials, scale-up and automation issues for a new branch of solar manufacturing. It's going to take even more creativity to access the capital required to reach true volume production in a solar market replete with multi-gigawatt-scale global vendors continuing to drive down cost and improve performance.